I come from time to time to your blog. I don't particularly enjoy it, although I try to read all posts. But this time I think I have had more than enough. I think it is not fair of you to suggest the French were not spirited. I think it is just more of the same from your side, after the idea of the Anglo-French competition was not put in place. 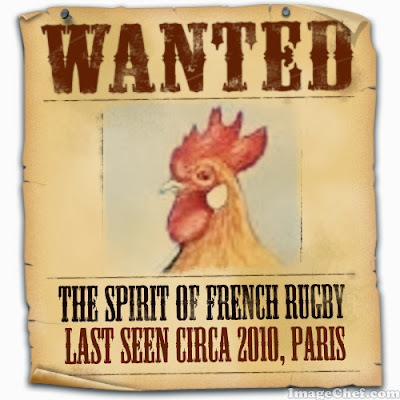 Last seen in 2010? I think you did not watch the entire 2011 RWC, did you? Also, was it also spiritless to come back from behind earlier this 6N in Paris to defeat England? Your comments are often one-eyed, the way you speak about France shows little respect (and France tends to receive less flak from you than other usually do like Wales). France have been pretty awful, playing negative rugby. I blame the influx of foreign players in the Top14. RWC2011 they played one good game, the final. Apart from that we saw them being beaten by Tonga and winning by 1 point over a 14 man Welsh team. 2013 six nations, i think their final position sums it up, last. This year they were lucky against England and only really started playing against Ireland. So i think Total Flanker has pretty much summed up the state of the French National team quite rightly. The end of an era...? Whatever happened to: the Forward Pass?